Google is paying tribute to the renowned cartoonist Mario Miranda on his 90th birth anniversary by dedicating today's Google Doodle. Miranda is best known for his works published in The Times of India and the Illustrated Weekly of India. Cartoonist Aaron Renier, who created the doodle, took to his Twitter handle and wrote, "If you google, why not try Google India today? I did the doodle for the great Indian cartoonist #MarioMiranda." 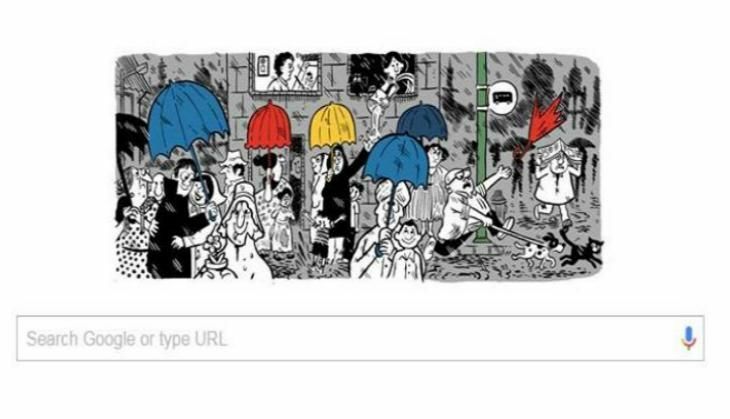 The doodle depicts a busy town with monochromic people and colourful umbrellas. In Goa, Miranda's hometown, his friend and curator of the Mario Gallery Gerard da Cunha, will mark the occasion with the release of a book titled 'The Life of Mario -1949.' The book is the latest in a series, which include '1950' and '1951'. Miranda, who passed away in December 2011, authored several pictorial travelogues on some of the most famous cities in the world including Lisbon and London.